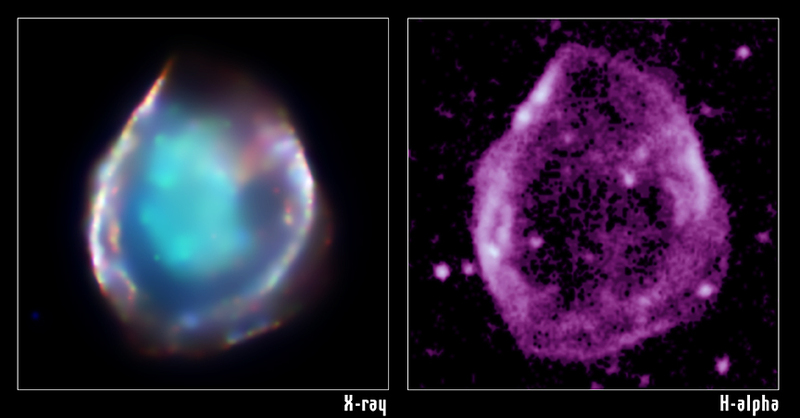 NASA's Chandra X-ray Observatory image (left panel) of the supernova remnant DEM L71 reveals a hot inner cloud (aqua) of glowing iron and silicon surrounded by an outer blast wave. This outer blast wave is also visible at optical wavelengths (right panel). Data from the Chandra observation show that the central ten-million-degree Celsius cloud is the remains of a supernova explosion that destroyed a white dwarf star. DEM L71 presents a textbook example of the double-shock structure expected to develop when a star explodes and ejects matter at high speeds into the surrounding interstellar gas. The expanding ejecta drive an outward-moving shock wave that races ahead of the ejecta into the interstellar gas (bright outer rim). The pressure behind this shock wave drives an inward-moving shock wave that heats the ejecta, seen as the aqua cloud. The clear separation of the shocked matter and the heated ejecta in the Chandra image allowed astronomers to determine the mass and composition of the ejecta. The computed ejected mass was found to be comparable to the mass of the Sun. This and the X-ray spectrum, which exhibits a high concentration of iron atoms relative to oxygen and silicon, convincingly show that the ejecta are the remains of an exploded white dwarf star. The size and temperature of the remnant indicate that it is several thousand years old. Astronomers have identified two major types of supernovas: Type II, in which a massive star explodes; and Type Ia, in which a white dwarf star explodes because it has pulled too much material from a nearby companion star onto itself. If the mass of the white dwarf becomes greater than about 1.4 times the mass of the Sun, it becomes unstable and is blown apart in a thermonuclear explosion. This was the case in DEM L71. One of the major goals of the study of supernova remnants is to determine the type of supernova explosion. The identification of DEM L71 as the remnant of an exploded white dwarf, or Type Ia supernova, represents a major step forward in understanding more about the ways in which stars explode. Coordinates (J2000) RA 05h 05m 41.70s | Dec -67° 52’ 38.00"
References J. Hughes, et al. "Iron-rich Ejecta in the Supernova Remnant DEM L71" Astrophysical Journal, 582, L95, 2003 Jan 10.